Fall safety nets resemble the guardrail nets fastened to scaffolding. The difference lies in their function. 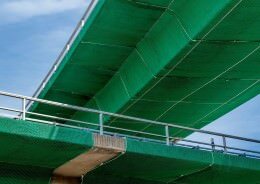 Whereas guardrail nets directly protect people and materials from falling, in accordance with the German Employers’ Liability Insurance Association rules for working on scaffolding, fall safety nets or guard nets come into operation to protect someone when a fall from a height could not be prevented by any other means. The person falling is thus protected from a more serious fall and from injury. The use of catch nets to protect people from falling from heights is mandatory in overhead line or hall construction, though the nets can of course also be used for other purposes – e.g. as a pond nets. 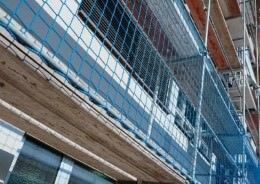 The rules of the German Employers’ Liability Insurance Association for the Building Trade (Bau-BG) also specify the properties of the material. A fall safety net must have a certain energy absorption capacity to be able to safely catch people in an emergency. For this reason, the German Institute for Standardisation European Standards (DIN EN) 1263-1 specifying precise technical safety regulations and 1263-2 specifying instructions for installation must be observed in the case of the exceptionally tear proof fall safety net. The fall safety nets that we offer fulfil these provisions and, when new, even exceed the required minimum energy absorption capacity. Thanks to this safety margin, our fall safety nets offer the greatest possible safety. At our Safetynet365 shop, you can find a large selection of fall safety nets in different standard sizes. If you can’t find just the right net, we’ll produce a fall safety net that’s precisely made to measure. In the case of hard-wearing polypropylene fabric, you can choose from mesh sizes 45, 60 and 100 mm. The individually made catch nets thus provide optimal fall protection.